During the qualification period each participating gym will set custom-tagged HardMoves problems. Each athlete then has four to eight weeks to try and send these problems, tracking their successful ascents on both their scorecard as well as its online counterpart. After qualifying is completed, participating gyms will assemble their best athletes into teams, which will then be pitted against one another in the regional Battles. The best gym teams from these Battles then qualify with their top athletes for the Final in Wuppertal. The Final is going to take place at the DAV Kletterzentrum Wupperwände. Here the finalists of each team will have just a few hours to climb 40 freshly set problems. As in the qualifying round the athletes will be noting their successful ascents on a scorecard. This determines the top 6 teams and their best six athletes respectively, who then go on to the Super Final. The final six teams will go head to head in a deep-water soloing contest at Wuppertal’s Historische Schwimmoper. They face a total of six boulder problems, each of which is climbed by only one athlete from each team. 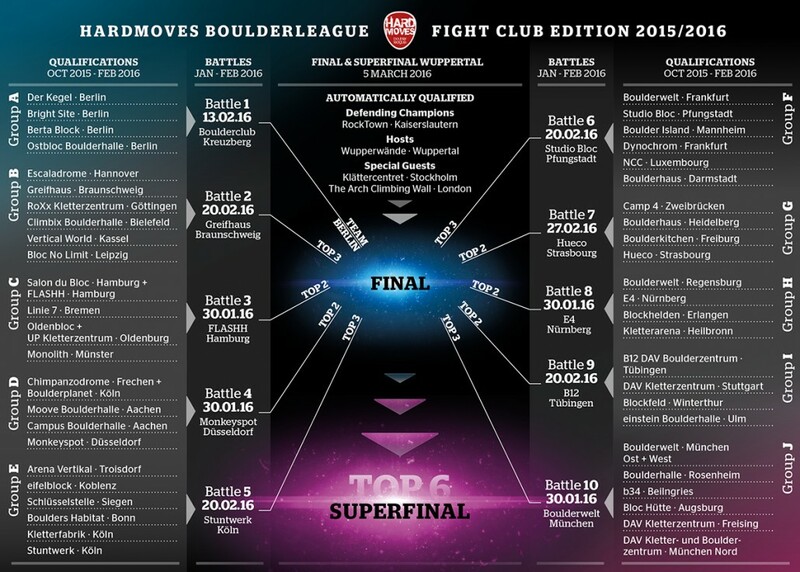 The team with the most successful ascents wins the HardMoves Boulderleague Trophy, while the top 3 teams receive prize money.